We have a #5 ranked team and the crowd was unusually sparse and usually "not" loud. Embarrassing that we had a larger and louder crowd last year in Charleston that at a home game vs a ranked opponent. Come on Terrier fans, Rise Up!!!!! The thing with crowds is that, generally speaking, your away crowd is going to be in aggregate louder than a home crowd. Because only the enthusiastic fans go to road games whereas many people make home games part of their fall weekend schedules. Crowd size and enthusiasm is a problem everywhere in FCS. There's no sense in wallowing and finger shaking, the best way you can encourage people to stand up and cheer is to do so yourself. It's my experience that the better we are, the better the crowd is in terms of engagement. YT...I'm not "generally speaking". Go to a James Madison game or for that matter at Citadal and tell me how the FCS lacks enthusiasm!! There are a lot of FSC programs around the country that don't lack enthusiasm!! Not to mention we are a top 5 program in the country at the present time. So by your anaylasis the stadium should of been packed and rocking. Just because we are a smaller program in the FSC isn't an excuse not to "Cheer" for your team. I've been to HS football games that have more excitement than a home game at Gibbs Stadium. And if you think the players don't see it and feel the same way you're mistaken. This isn't an issue where we crunch #'s or use analytics or talk in general terms. I stand up the majority of the game and always during a critical time. So if you want to follow my lead I won't be hard to find...just look in section H3 or H4 and you will see me. Heck you'll probably see me waving my hands encouraging other fans to do the same. Agreed the GameDay experience at Wofford is lack luster and not representative of a team in a top 5 ranking. There are little and inexpensive things that can be done to raise enthusiasm and create a real home field advantage. 1. How about using the display board and playing a "defense" visual and hype song on 3rd downs. 2. How about every 1st down conversion the announcer actually says..."And that's another Wofford" and fans finish the rest. 3. How about an actual pep band? Use the same students that do the Basketball games. 4. Student section "Hype man" where the students have their chants, streamers, megaphone, etc. Shorthair13 wrote: YT...I'm not "generally speaking". Go to a James Madison game or for that matter at Citadal and tell me how the FCS lacks enthusiasm!! There are a lot of FSC programs around the country that don't lack enthusiasm!! Not to mention we are a top 5 program in the country at the present time. So by your anaylasis the stadium should of been packed and rocking. Just because we are a smaller program in the FSC isn't an excuse not to "Cheer" for your team. I've been to HS football games that have more excitement than a home game at Gibbs Stadium. And if you think the players don't see it and feel the same way you're mistaken. This isn't an issue where we crunch #'s or use analytics or talk in general terms. I stand up the majority of the game and always during a critical time. So if you want to follow my lead I won't be hard to find...just look in section H3 or H4 and you will see me. Heck you'll probably see me waving my hands encouraging other fans to do the same. At Wofford we have success, but when it comes to competing interest, we're low priority for the public in Spartanburg and SC. Most alumni and students I know will pay attention and get passionate about Wofford football/basketball if they know they are doing good, but it's not the highest priority for many people. It's not that we have some deficit of enthusiasm relative to other programs, it's quite literally because we are smaller than them. Meanwhile, if you go to conferences like the MVFC a lot of times they have good following because their FCS teams are the equivalent of their FBS teams and there's no pro teams. They also have more students. Still, the perennial "problem" in all of the FCS is attendance and enthusiasm. We fill our small stadium about 1/2 its capacity and we're better than many many FCS teams. If you tune into any FCS game that isn't a perennial power, you'll see lots of stadium 3/4 empty. I'd love to see the statistics for the size of the average stadium compared with average attendance. I'd love to see us do better and cheer louder and all of that good stuff (when I was at Wofford at times I felt like I was the only one who cared about the team, Greek Life is king there), but I've learned it's better to just cheer yourself and recognize it's not a Wofford problem, it's an FCS problem, and really a problem for every team that isn't power 5. Shorthair 13 IS MY TYPE OF FAN....anytime I’m in town for a game I promise I’m causing all types of noise and energy. And I’ll be right there with you screaming and hollering for the TERRIERS. I feel that Wofford suffers identity crisis as a fan base. I’ve heard for years the stories of yesteryear and what used to be, when the reality is, we are currently in as successful of a run as there’s been around here maybe ever.....these last 2 years where we are an inch away from the National Semifinals then come right back and are undefeated, getting better each week and sitting in the top 5.....and with the talent to threaten to contend for a SOCON TITLE and potentially a national title contender. Fans should really be out enjoying this team as much as possible......this type of team isn’t the norm for many programs on any season. They deserve to have a home field that rocks in support!!!!! Somehow we are missing he point here. It's not with the # of people in the stands..so it's not a #'s issue. Of coarse we won't have the #s such as a James Madison....much bigger student population. It's not getting them in the stands it's getting them on there feet and cheering and showing some type of excitement. I have talked about this issue with others and the best thing that was said is our fan base is a "wine and cheese crowd". Couldn't agree more with that statement. I don't know many but the most dedicated that would be there in the rain yesterday. The average age of the people around me in my section is in their 60s. Most of my friends, who are not alumni of Wofford, are at Clemson or Carolina games. In the church I serve it's the same story. I drive 2.5 hours for most home games. I am a member of the terrier club. I moderate a small football messageboard. I raised a son who went to Wofford and who still supports Wofford. Agree with much of what is said. Interestingly there appeared to be very few students at the game Saturday. We can talk about all the reasons the fans in the region don't go to games-Clemson or USC playing, etc. It's the students staying away that bothers me. If they are on campus-and that may not be-why would it not be THE THING to go to the games. What can be done to make it the place to be? I had this conversation with Lennie a year or so ago, and it is very concerning. I even asked if the rest of the student body interacts with the football players as fellow students. Coaches often don't want their players in fraternities or sororities or involved with social life outside their team; which is to some degree understandable. However, as small as Wofford is we would hope that would not be the case. As for The Citadel, their students are required to attend and cheer, so that's not a good comparison. When it gets down to it, the question that can be asked is "why are we playing football?" 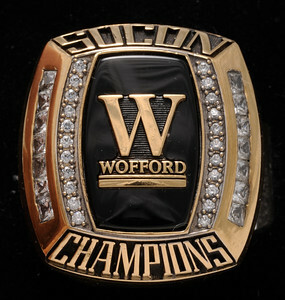 I would like it to be for the whole Wofford community, but sometimes you wonder what the real answer might be. We have one of the best facilities with the easiest parking and access of any I can imagine. The Greek Village is next door, with the dorms a short walk to the stadium. What can get our students and their friends to the games? Students attending (and staying) for games is a problem everywhere to some extent. Nick Saban threatened to revoke Greek Life tickets a couple years ago to put things in perspective. there wasn't a special event that I can remember on Saturday (parents weekend, first game, homecoming, etc) and it rained, so I'm not surprised that attendance was so-so. Long term, I think you'll see more enthusiasm from the students, provided we maintain success. Before the village, tailgating was terrible for students because there wasn't a good spot. Given the village, success and time, you'll see some enthusiasm bloom. Last edited by youngterrier on Sun Oct 08, 2017 10:27 pm, edited 1 time in total. My impression is that a lot of Wofford fans are not really FCS-savvy (members of this board being obvious exceptions). Fans get excited for FU and the Citadel (and in the past ASU and GSU), but show a lot less interest in WCU, Chatty, VMI, ETSU and Mercer. Most concerning, however, it that fan interest is down nationwide. The attendance at FU and El Cid is down from their peaks 10-20 years ago. Even at Clemson, students show up for a quarter or two and then leave. Obviously, the Citadel mandates attendance which helps their cause. Attendance at non-power five level is a very tricky thing. I sympathize with the players' and parents frustration. They deserve better. I think it would help to include on our video screen the national rankings of FCS and the status of games-and the status of SoCon games more often. The fans want to know those things and it would help to see where we rank and who is behind and ahead of us. Another thought-the music was great at the game. I'm an old guy, and the music was great for all ages. Well done. It's water under the bridge now (too bad there was not "video review" in this game). Here's a frame by frame look....... interception or an incomplete pass?